Family-friendly activities and places to take the kids this Autumn. Want to get your kids involved in music – either playing it or just listening? Tune in to these ideas. Andrew Lloyd Webber’s hit musical is coming to town – and it’s sure to leave kids feline fine (no, we can’t resist the puuurfect puns). Crown Theatre, April 16-May 8. For the sophisticated toddler – the fun performances by EChO (the Education Chamber Orchestra) introduce children to the various instruments and their performers. Perth Concert Hall, May-June. with an excellent educational methodology. 18 months-5 years, Como. WASO Kids’ Cushion Concerts (photography Nik Babic). If your youngsters like to bust a move, then this is the one for them. It’s inexpensive, and draws a big crowd for a relaxed dance party. 1-5 years, Mount Hawthorn. Family-based (classes are mixed-age, to accommodate siblings) and interactive, this class features music from around the world. 0-5 years, Scarborough and Leederville. Part of the Kindermusik program, this class involves music and movement activities, and is run by a former WAAPA student. 0-5 years, North Perth. Sick of lukewarm toast and tea on Mothers’ Day? Then why not get your Junior MasterChef along to a cooking class these holidays? If you and the little one have a sweet tooth, Bluewater Grill in Applecross runs a scrumptious Cookie Creations class (for 6- to 12-year-olds, April 16), and Rochelle Adonis does a divine cupcake class (4- to 9-year olds, April 13 and 20). What’s 2 Eat? in Wanneroo runs healthy and allergy-friendly classes throughout the holidays (from 3 years and up, Monday to Friday), while for serious young chefs there’s Taste Budds in Highgate, offering longer classes for 8- to 14-year-olds (dates TBA). Matters of Taste in Bicton also runs classes for 10- to 16-year-olds (April 19-21), teaching several mouth-watering recipes. WA is home to some inspiring children’s authors. Here are some of their latest offerings. and what’s the reason behind her sudden appearance? Sally Morgan and Ambelin Kwaymullina, Fremantle Press, $24.99. Riotous colour and bouncy, rhythmic prose bring this tale of individuality and self-esteem to life. PLAY SPACE | In a world where kids are constantly told to shush, this is a spectacular area dedicated to those who like to make noise. Perth Cultural Centre. YOKINE RESERVE | A trendy, well-planned, nature playground with a great music section. Wordsworth Avenue, Yokine. MUELLER PARK | Recently refurbished to include musical activities, this fenced playground boasts a giant set of jungle drums. Roberts and Coghlan roads, Subiaco. Photoh’s course for teenagers teaches basic photography principles. If you think your teen can do better with their camera, get them along to this class. Two-hour sessions for 12- to -18-year-olds teach them about the basic principles of focal length, aperture, shutter speed, ISO, lighting and exposure. Photoh, Saturdays. School holiday classes with strings attached are offered at Spare Parts Puppet Theatre for 4- to 6-year-olds (one-day courses) and 7- to 12-year-olds (two days). Kids get to explore puppetry skills with professional tutors in the historic theatre. Visit sppt.asn.au for details Various dates. If you find yourself using the euphemism “overly energetic” to describe your offspring, get them to the popular BOUNCEinc in Cannington (a teenage trampoline heaven), Jungle Gym in Willetton (with a fantastic morning session for ages one to five) or, for the little racers, try the road-theme park at the Pitstop Playground in Banksia Grove. Ongoing. Catch free films for families on Saturdays (before the late-night revellers descend). Rango, James and the Giant Peach, and Inside Out are all on the list this season – see visitperthcity.com for the full program. Northbridge Piazza, various times. Bambert’s Book of Lost Stories (photography Matt Biocich). When reclusive writer Bambert sets his stories free, he sends them out into the world on little balloons with instructions: whoever finds them is to return them with a stamp, so he knows where they should be set. This play brings Reinhardt Jung’s lauded novel to life and reminds us how stories connect us. Ages 8 and over. Barking Gecko Theatre Company, State Theatre Centre of WA, until April 23. Adapted from the heart-warming book, this puppet show promises to bring joy to all ages with its beautiful insights and humour. Perfect for ages 4-12. Spare Parts Puppet Theatre, until April 23. Screen-printing, textiles, pottery throwing, and animation are but a few of the classes for kids at the Fremantle Arts Centre. Gone are the days of macaroni photo frames, these lessons are the real deal. Full program details at fac.org.au/courses. Can’t get enough of giant, roaring, extinct creatures? Get along to Scitech for an adventure into the world of dinosaurs. Find out how palaeontologists got so savvy about dinosaur diets, and how fast a prehistoric beast can run – just watch out for the animatronic T-Rex. May 7-October 9. Barking Gecko Theatre Company brings us this troubling, yet at-times funny and uplifting play by the Australian Theatre for Young People. Nina and Erica are both 16 – one good at school, the other an outsider. What they do have in common is their music… For ages 14 and up. State Theatre Centre of WA, May 27-30. Frozen has brought Disney musical numbers back onto our playlists, so this performance is a great excuse to sing along to your favourites. We know you know the words to Let it Go. Perth Arena, June 2-6. Scitech’s Astronaut exhibition: a giant leap for your child’s imagination. 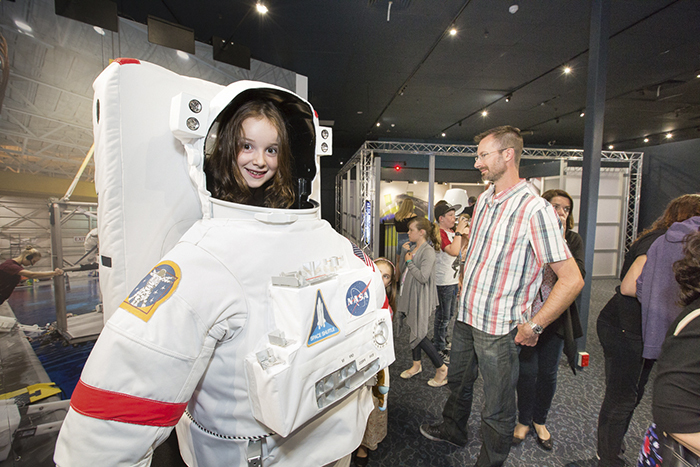 Scitech’s latest imagination-sparking exhibition, Astronaut, has captured the attention of young and old. Exploring a space lab, investigating Velcro-secured space food, and climbing into a sleeping pod are all possibilities in the popular exhibit. We spotted at least one parent jostling their child for a turn to spin themselves around in the G-force-generating rocket simulator. Exhibit experience coordinator Rachael Hughes says the immersive experience is part of the fun.